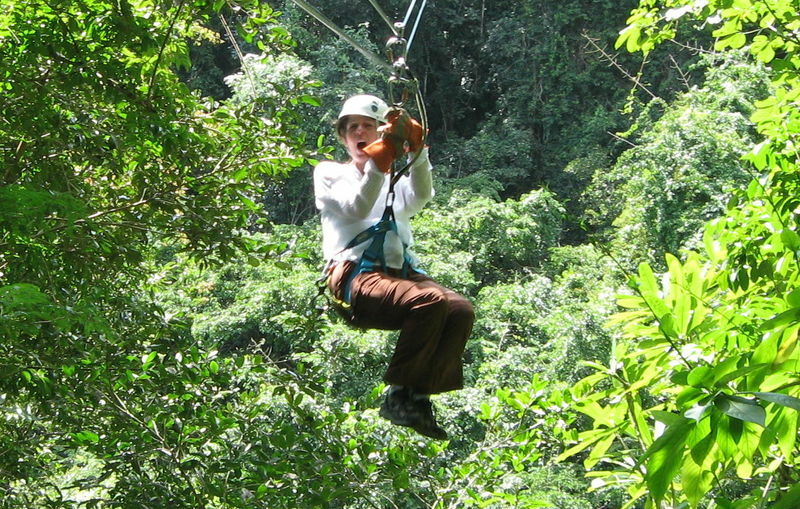 Zip-line aerial tours have become a popular attraction in various international locales, especially where there are remote jungles and rain forests. I'm not sure how ecologically correct it is to go swinging from platform to platform above the jungle canopy, but an aerial zip-line adventure was offered as a shore excursion on our recent cruise to Central America, so we decided to give it a shot. Our cruise ship had anchored offshore near Belize City, in Belize, so we hopped aboard a tender (a small boat) for the short ride to the port. 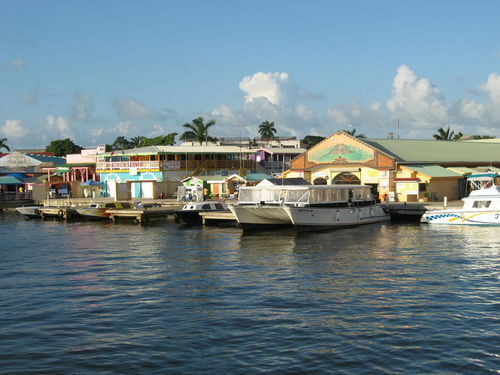 I don't know much about Belize other that it was formerly known as British Honduras before it gained its independence from the UK in 1981. It's a small country both geographically, and in terms of population (about one quarter million), and English is the main language. It's a parliamentary democracy modeled on the British system, and, with an upcoming election, we immediately noticed an assortment of billboards and political placards plastered everywhere. The port was quite colorful and bustling with activity as local touts accosted the hordes of newly arrived visitors with offers of various tours and other adventures. 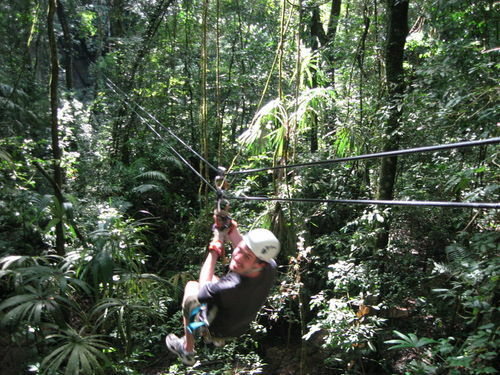 We immediately gravitated toward a young man who was waving around a sign that read "Lost World Canopy Tour", but while we waited for the other members of our group to arrive, we wandered nearby in the vicinity of what appeared to be the main tourist area, an assortment of shops and restaurants. After the rest of our group arrived (about 20 others), our guide, David, led us to a battered school bus, then explained that it would take about an hour and fifteen minutes to get to our final destination in the rain forest. For the first 40 minutes we were on a paved highway and as we drove, David provided a brief introduction to Belize, including a discussion of its local politics and recent history. Eventually we got to a turn-off on to a gravel logging road, and our progress slowed considerably as the driver concentrated on dodging potholes for another half-hour. At this point, we noticed that the geography was rather desolate with a lot of scrub brush and wide-open space. We pulled into a secluded picnic area, apparently about two miles short of our destination, and were offered cold drinks and a chance to visit the nearby rest rooms. 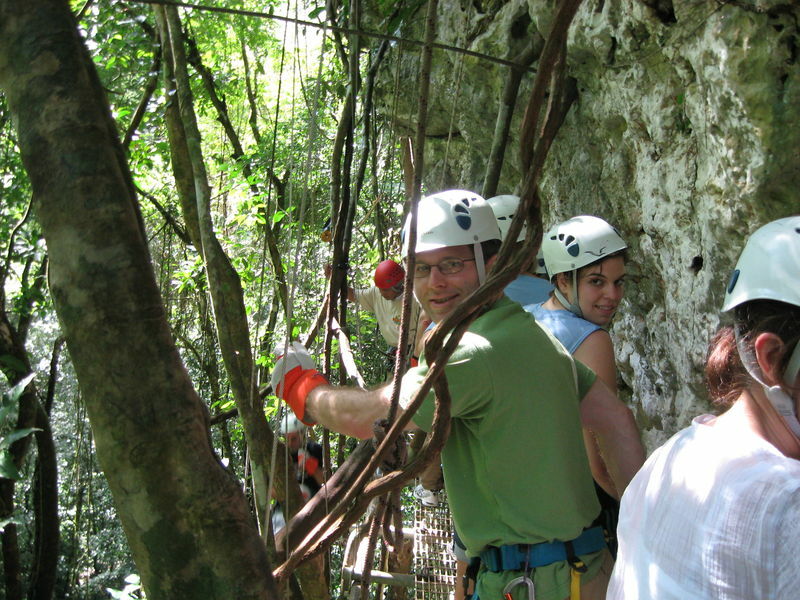 After reboarding the bus, we proceeded a little further along a single lane dirt road that then abruptly entered a region of dense tropical vegetation that shortly opened into a clearing, where we disembarked. 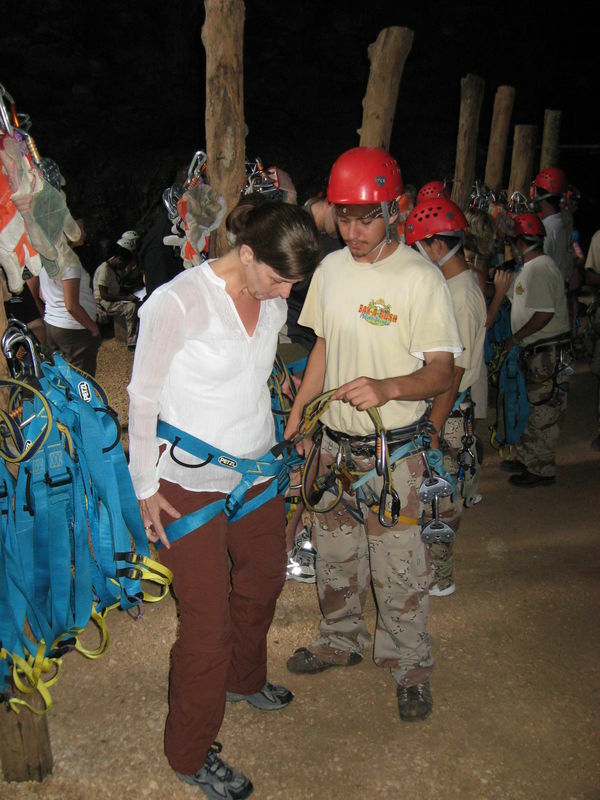 We were introduced to our zip-line guides who led us to an equipment staging area where we were individually outfitted with helmets, harnesses and safety lines. 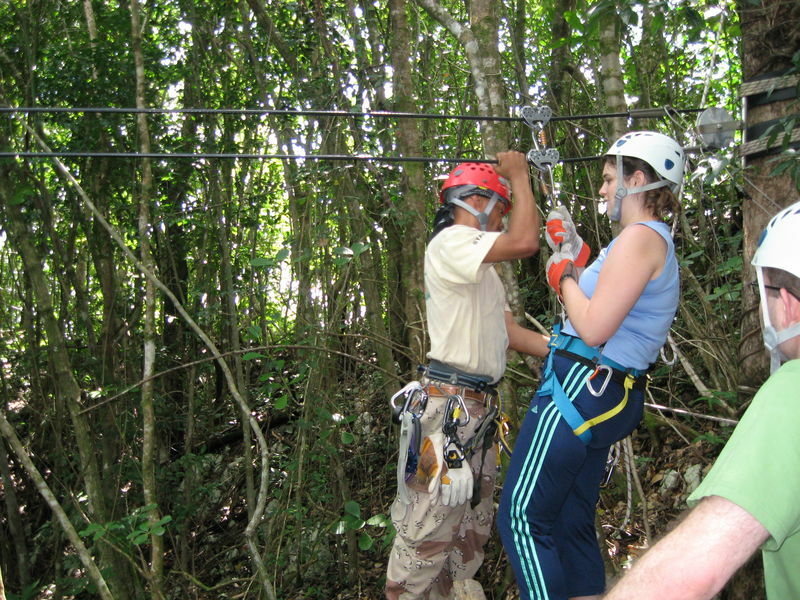 We were directed along a short trail to a cave-like entrance within which was a small amphitheatre and a low-slung twenty foot demo zip-line and we were given a demonstration on how to balance and guide ourselves along the zip-line from one platform to the next. 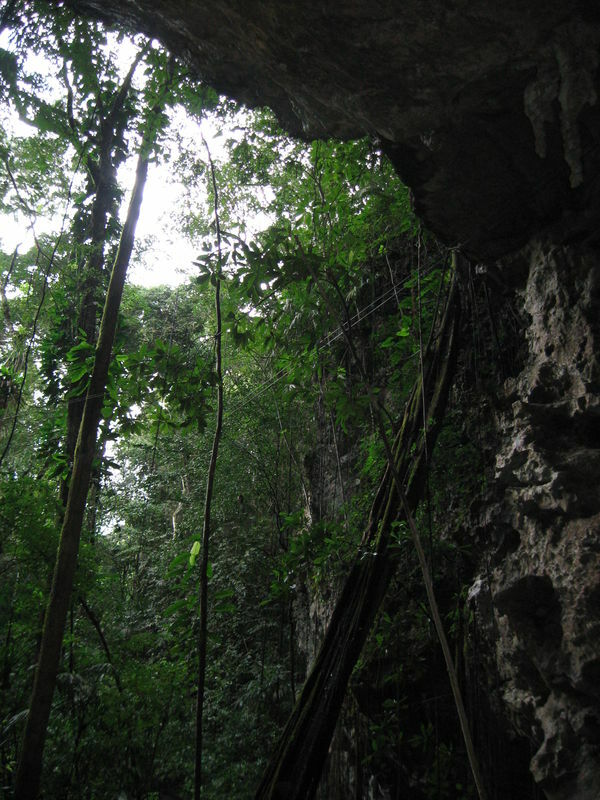 We entered the canopy through a large cave. 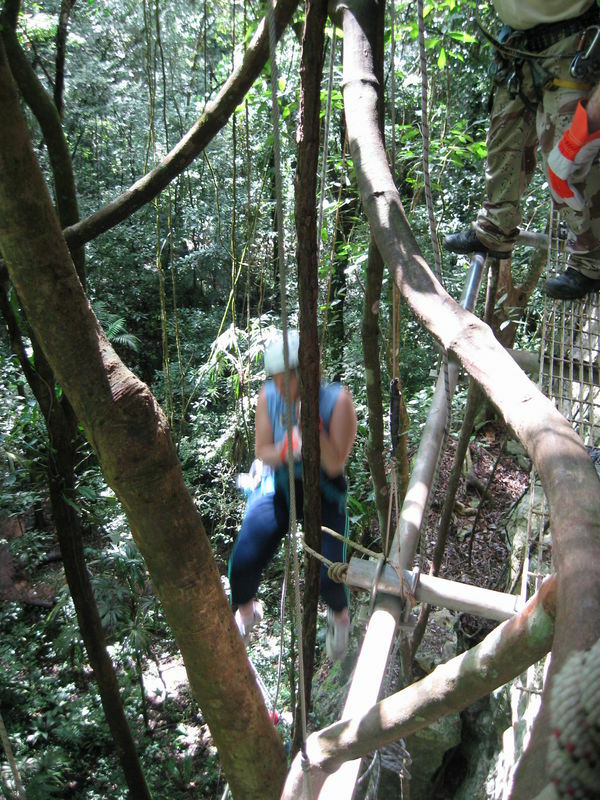 We stepped gingerly along a suspended catwalk! 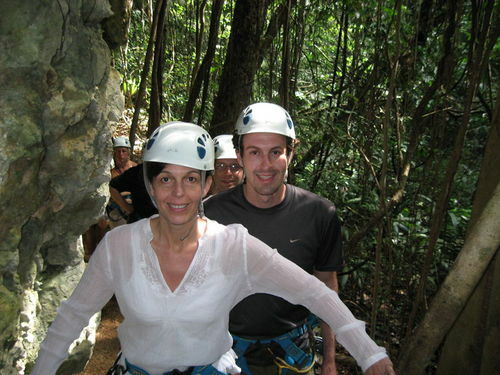 The rappel was a sheer drop! After a strenuous but brief (fifteen minute) hike along a narrow and slippery trail we arrived at the first platform located on an outcropping in the hillside appearing to be about fifty feet above the rainforest basin. 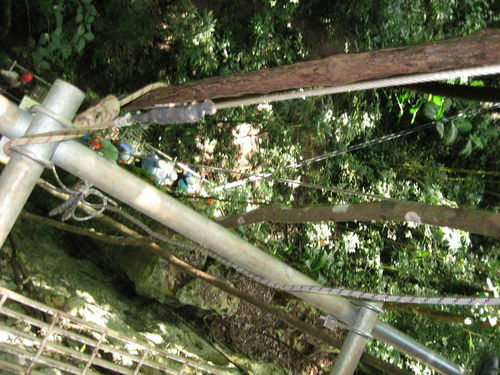 One at a time, each person was connected to the aerial line by two pulleys, with the guide double-checking to be sure that a secondary safety hook was also secured. After telling you to lift and face your legs forward, the guide gave you a shove, and off you went soaring above the forest canopy. Yikes!! What a rush! It was at this point, dangling in mid-air and half-way to the next platform, that I suddenly realized that my first estimate of being fifty feet above the ground was waay off! 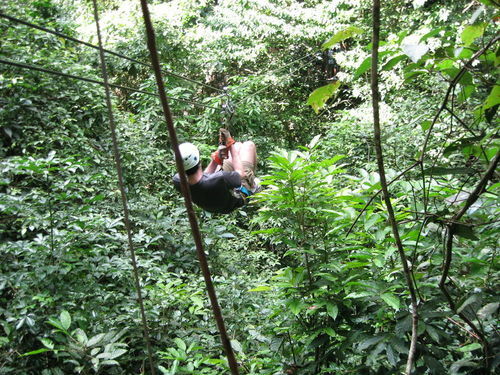 At the far end of the zip line, another guide waited to grab and steady you as you landed on the platform, quickly snapping your pulleys and safety hook from the line. 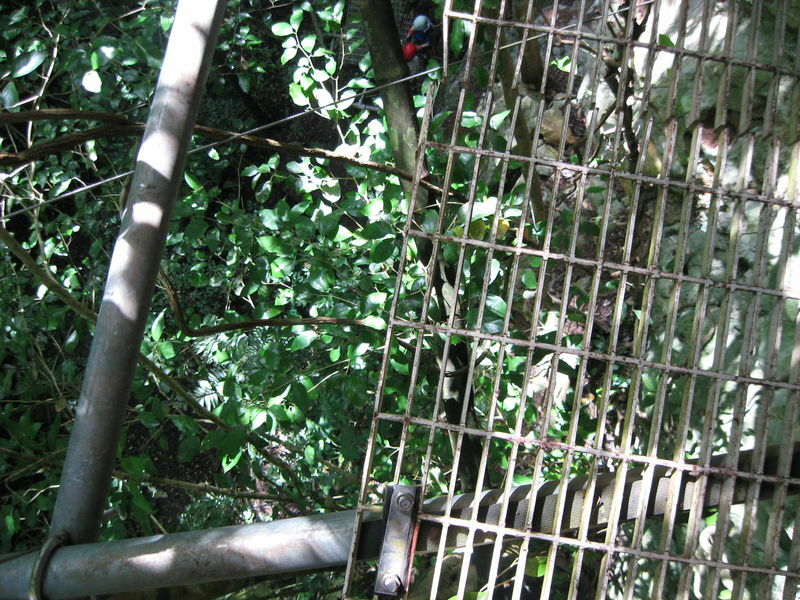 A short walk along a steel lattice catwalk suspended by cables (with nothing below) brought you to the next platform where the process was repeated. We were hooked up to the zip line. 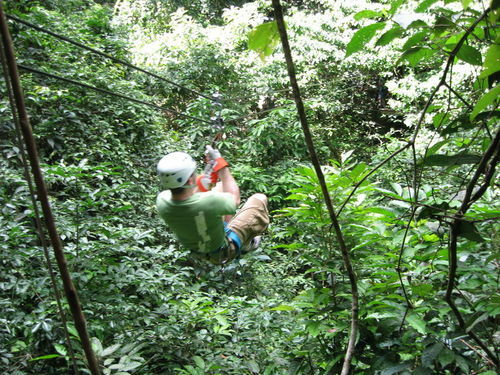 There were five traverses in all, ranging from about 100 to 500 feet, each taking you through a different part of the forest. Several transported you over wide-open spaces and provided panoramic views while stringing you hundreds of feet above the jungle floor, while others carried you into dense vegetation with no visibility at all. After the third traverse there was a vertical rappel of about fifty feet straight down that felt far more tenuous than the zip-line, while the guide controlled your (rapid) descent to the next level. After the fifth traverse, there was a long, winding catwalk suspended at the top of a cave, following which there was one more vertical rappel of about thirty feet that brought you back down to the base of the cave. After completing this final rappel, the guides helped each of us remove our gear, then provided cold drinks. The bus returned the group to the same picnic area down the road where we had stopped previously, and a light lunch consisting of skewers of barbecued meat and vegetables, as well as baked beans and cold drinks, was served. There were some nice photos available for purchase (taken by the guides), but these were pretty pricey, so we decided to stick with our own shots. The ride back to the port was uneventful (except when our bus driver decided to pass another slow-moving bus while still on the gravel road). 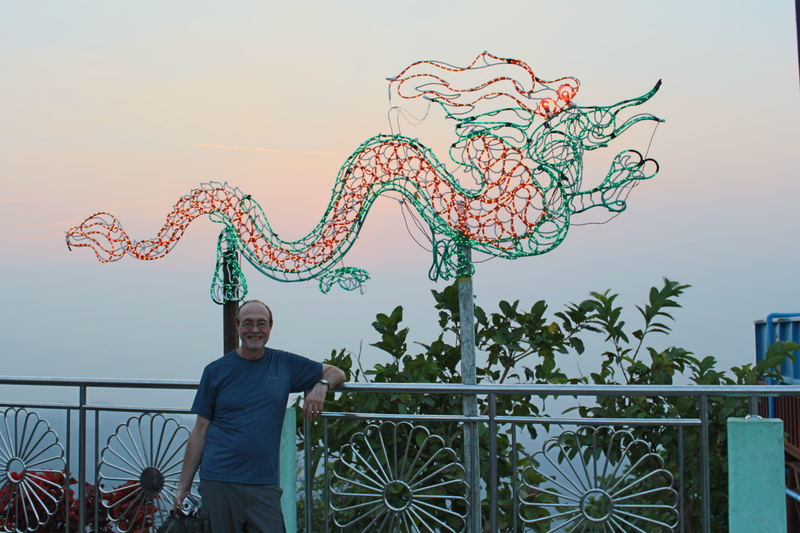 But we arrived intact, and before heading back to the ship we spent some time wandering through the tourist market and checking out some of the local crafts. 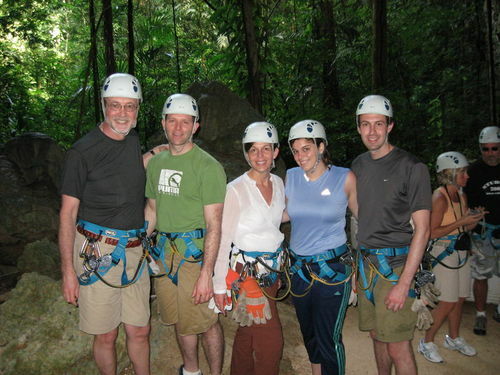 On the whole, it turned out to be an excellent adventure and was clearly a highlight of our cruise vacation.